Unlike many other countries, America has a consumer-driven economy. The National Association of Home Builders (NAHB), in a couple of recent entries in its Eye on Housing blog, highlights the role home buying plays in that dynamic. 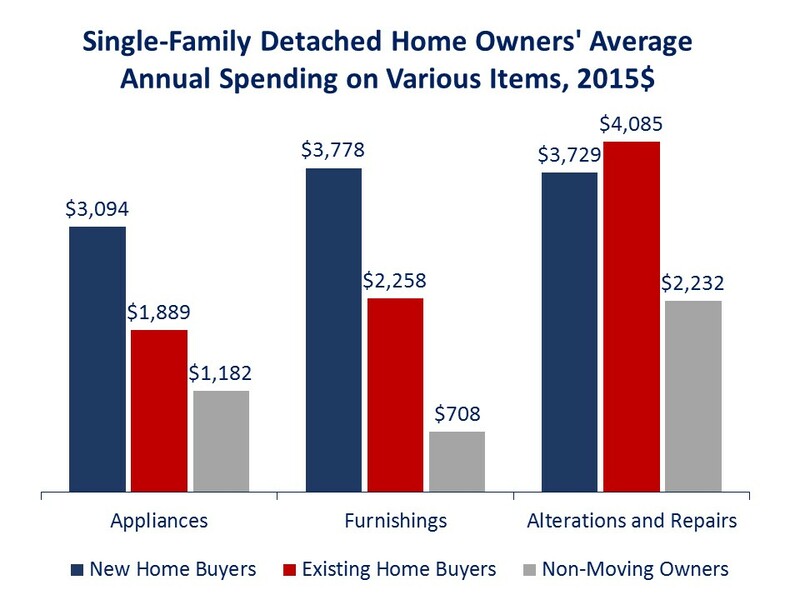 NAHB’s Natalia Siniavskaia used data from the Bureau of Labor Statistics’ most recent (2012-2014) Consumer Expenditure Survey (CES) to determine what a buyer spends on appliances, furniture, and remodeling in the first two years after they buy a home. Siniavskaia looked at buyers of both new and existing homes, and compared each to a non-moving homeowner. Buyers of new homes spend most, outspending non-movers by a factor of 2.6. Buyers of existing homes spend twice as much as non-moving owners. The typical new-home buyer spends an average of $4,500 more than a non-moving owner and the buyer of an existing single-family home spends $4,000 more, $3,700 in the first year. The author says home buyers, especially those buying new homes, tend to have larger households with children and are on average wealthier, better educated, and concentrated in urban areas, any of which could potentially explain their higher level of spending. The biggest outlay in the budget of new home buyers is furnishings where they typically spend about $3,778, $2,500 more than a non-mover. They spend $1,250 more on appliances, and $714 on property repairs and alterations. Existing home buyers spend $1,200 more on furntiure during the first year and another $500 the second and $433 more on appliances. Those existing home buyers who purchase an older home spend more than $2,000 on remodeling, most of it the first year they own. The analysis further shows that home buyers don’t compensate for their higher level of spending by cutting back on other things like entertainment, travel, restaurants meals, etc. “This confirms that home buying indeed generates a wave of additional spending and activity not accounted for in the purchase price of the home alone,” NAHB says. Specifically what do home buyers purchase? The biggest ticket item for new home buyers is sofas, spending an average of over $700, 60 percent more than spent by buyers of existing homes and 6.4 times more than spent by non-movers in a year. There is also a large effect on purchases of living room (other than sofas), dining room, and kitchen furniture with new home buyers spending $687 on living room chairs/tables and another $345 on kitchen and dining room future, outspending existing home buyers 12 to 1 in both categories and non-buyers by 5 and 9 times respectively. The differences in spending patterns are similarly large when comparing spending on window coverings. New home buyers spend 10 time more than existing home buyers and 4 times more than non-buyers. The biggest outlay in the appliance budget of new home buyers are for laundry equipment, landscaping equipment and computer hardware/systems. They outspend both existing home buyers and non-buyers on all of these and on big-ticket items like refrigerators and televisions as well. Siniavskaia says the high level of appliance spending may seem surprising given that many new homes come equipped with them. However, she cites a survey by the Home Innovation Research Labs found that two-thirds of new homes built in 2015 came without laundry appliances and 36 percent had no installed refrigerator. Also unexpected, new home buyers spend almost as much ($3,729) as existing homes buyers ($4,085) and outspend non-moving owners ($2,232) on property alterations and repairs, but they spend on quite different things. Existing home buyers and non-movers spend more on various repairs and replacements and on kitchen/bathroom renovations and purchase and installation of new systems while new home owners spend on outside additions and alterations, including new driveways, walks, or fences. The NAHB analysis updates their 2008 study based on CES data from 2004-2007. This housing boom era study showed somewhat higher spending by home owners overall. Nevertheless, the tendency of home buyers to outspend non-moving owners on appliances, furnishings, and home improvements was similar.